If you've ever heard of a pie called Derby Pie, you know that it's a thing of great beauty. It's got nuts, it's got chocolate, all tied together with plenty of butter and maybe even a little booze. And it has a great story, if I do say so myself. That story is featured in my upcoming book, The Secret Lives of Baked Goods: Sweet Stories & Recipes for America's Favorite Desserts. I tell you all this because I love any chance to talk about the new book...but also because it's a nice lead-in for this recipe. This recipe is not for Derby Pie. But, it is sort of like a cousin to the famous pie. Because yes, it has nuts and chocolate. But this version is special. 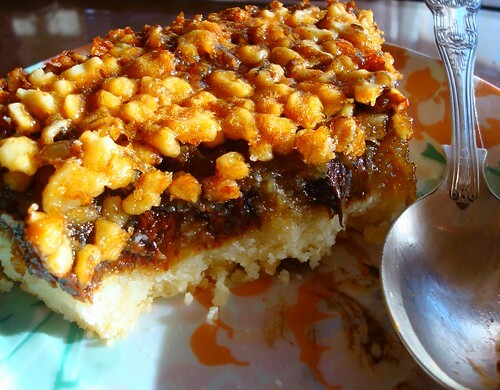 It's ridiculously rich in toasty walnuts and chocolate, but is very special because it's baked with a shortbread base as the crust. 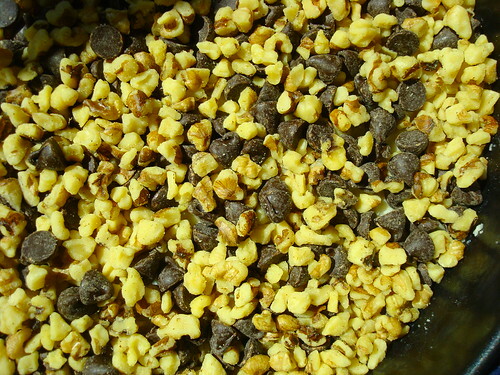 The exposed caramelly sides form a sort of chewy crust that is sort of like the texture of Mary Janes candies. Now, this is not going to be a texture to everyone's liking, because it will make your teeth stick together. 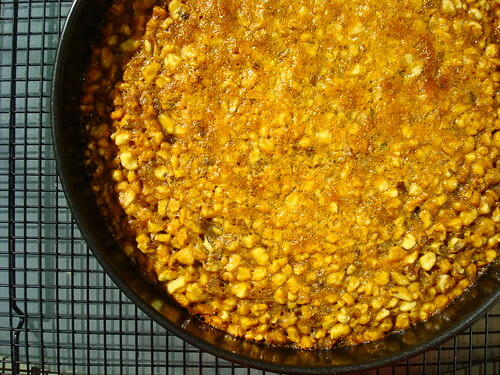 But I have always rather enjoyed that part of those particular candies, and found it a lovely alternative to the back crust on a pie with corn syrup, which can get hard (you know what I mean?). First, prepare the crust. Cream butter and sugar together until fluffy. Add flour and mix til fully incorporated. Press dough into a well greased 8-inch springform pan. 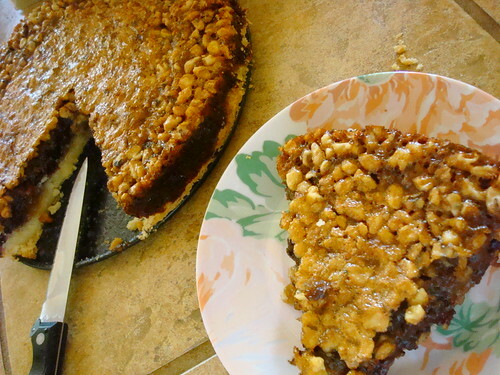 Sprinkle the walnuts and chocolate evenly onto the bottom of the crust; set aside. 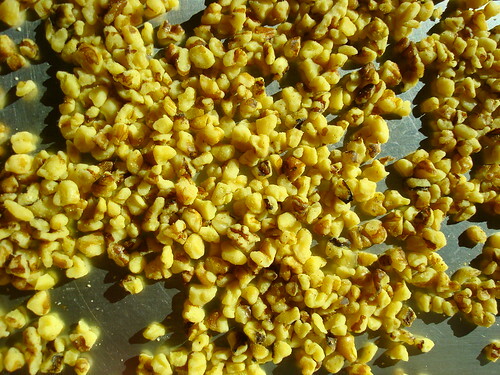 In a large saucepan, combine the corn syrup, granulated and brown sugars, and bourbon and bring to a boil over medium heat. Once boiling, cook for 3 minutes, stirring constantly to avoid scorching. Remove from the heat. In a medium bowl, whisk together the eggs, butter, cornstarch, vanilla, and salt. 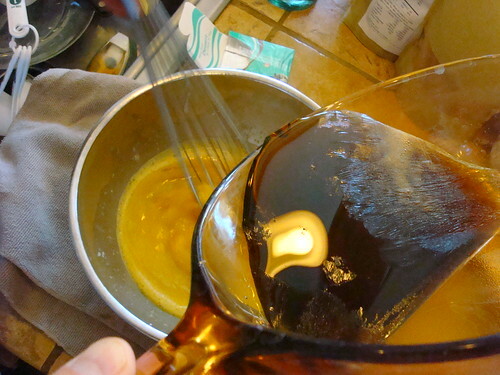 Slowly pour about one fourth of the hot mixture into the egg mixture, whisking constantly (if you add the hot syrup too quickly, the eggs will cook). Add the remaining hot mixture, continuing to whisk. 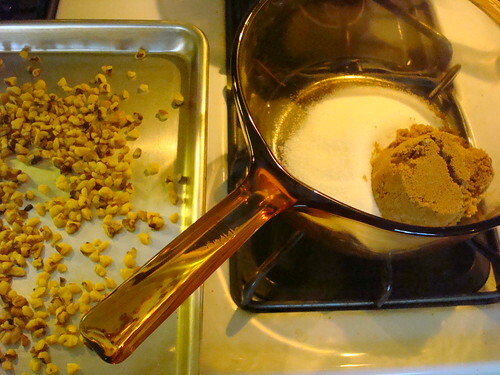 If you notice any small lumps in the mixture, strain through a mesh sieve. 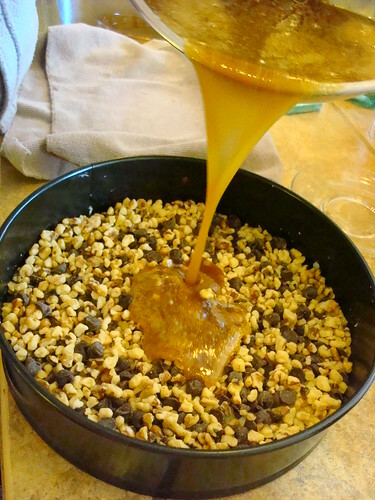 Pour the filling slowly over the nuts and chips, being careful not to move them around within the crust. Bake for 50 to 55 minutes, or until set in the center; transfer to a wire rack to cool. 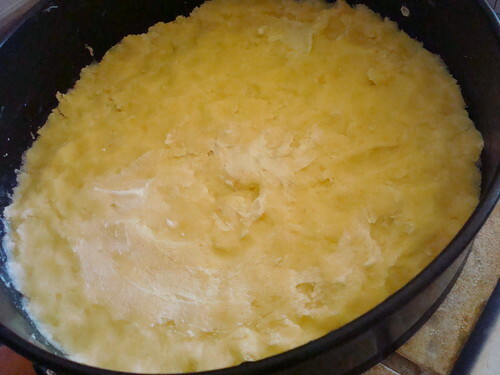 Immediately run a sharp knife along the edge of the pan to help loosen the sticky pie; then let it sit for at least 45 minutes before un-springing it from the pan. Serve the pie at room temperature with whipped cream or ice cream, if desired. To store the pie, wrap it tightly and refrigerate for up to five days.